Who Identified Men at the Boston Tea Party? Who Threw the Tea into Boston Harbor? Why All the Fuss Over Tea? A Real Ride by a "Country Girl"
One small trend in recent history-writing is to focus on people’s sensory experiences. (I suppose writing whole books on “place” got old.) I first encountered this at a Massachusetts Historical Society seminar a few years ago which eventually fed into Richard C. Rath’s How Early America Sounded. That paper was about various yelling, ranting, and singing Quakers, before that religious movement settled down and became associated with quiet contemplation instead. Rath’s book also covers church bells, language barriers, and the importance of “earshot” in a culture with no electronic communication system. I think another early example of sensory history is Elaine Forman Crane’s article “‘I Have Suffer’d Much Today’: The Defining Force of Pain in Early America,” published in Through a Glass Darkly. With few painkillers and no anesthetics, how did colonial Americans get through the day, especially a day with surgery scheduled? Since pain is subjective, baffling doctors even today, it’s very hard to compare one person’s experience to another’s. We must, as Crane does, fall back on thinking mostly about how people of the time thought of pain, particularly in how men and women were supposed to react differently to it. The most general sensori-historical approach I’ve seen is Peter Charles Hoffer’s Sensory Worlds in Early America. While Rath focuses mostly on the seventeenth century, Hoffer discusses such events as the Boston Massacre, so I had to give it a shot. And I was underwhelmed. So much physical detail might have been exciting for a historian who had previously focused on intellectual and abstract issues. Hoffer is a leading legal historian, and our legal system might in some ways be an attempt to get above how things feel to individual people to more general principles and rules. But I, having come to Revolutionary history through narrative writing in general and fiction writing in particular, never lost sight of the power of sensory detail. When I saw pictures of Boston’s Pope Night, therefore, it didn’t take a lot of imagination to conclude that the celebration was meant to be loud. “To judge by the number of horns [Swiss artist Pierre Eugène] Du Simitière drew [in 1767], the evening must have been ear-splitting,” I wrote in an essay for The Worlds of Children. An ear-splitting event, but not an earth-shaking realization. One can discern, in each case, a sensory element; but its significance is more a matter of context than of cause. At the very least, one would need a way of measuring the sensory against the political, the material, the ideational and so on, in order to make the case. There is, finally, a conceptual difficulty lurking beneath the surface of Hoffer’s entire project. The ‘report of the senses’ can never by itself achieve motive power, whether in the lives of individual persons, or in the histories of groups. That comes only through further steps of processing: steps that involve both cognitive assessment and (for lack of a better term) emotional charging. . . . It is, above all, emotional energy that drives specific human actions—the energy of fear, joy, anger, surprise and a handful of other ‘primary affects’ (in various compounds and combinations). Hoffer gives barely a nod towards this crucial aspect. Demos’s point seems even more important when we consider the findings from neurology that emotion is key to memory. We remember not what we sense, but what we sense and feel emotionally about. Earlier this week I zipped by Valley Forge National Historical Park, so it seems like a good moment to discuss a most curious text about Gen. George Washington at that camp that appears on a lot of websites. Presently I heard a voice saying, "Son of the Republic, look and learn," while at the same time my visitor extended her arm eastwardly, I now beheld a heavy white vapor at some distance rising fold upon fold. This gradually dissipated, and I looked upon a stranger scene. Before me lay spread out in one vast plain all the countries of the world—Europe, Asia, Africa and America. I saw rolling and tossing between Europe and America the billows of the Atlantic, and between Asia and America lay the Pacific. A second time the angel dipped water from the ocean, and sprinkled it out as before. The dark cloud was then drawn back to the ocean, in whose heaving billows in sank from view. A third time I heard the mysterious voice saying, "Son of the Republic, look and learn," I cast my eyes upon America and beheld villages and towns and cities springing up one after another until the whole land from the Atlantic to the Pacific was dotted with them. . . . I quoted some of this text as throwaway material on my other blog. Since then, I've dug deeper and learned more about its origin. The earliest publication of "Washington's Vision" that I've found was in the 24 June 1861 Philadelphia Inquirer. That December, it was published in the Pittsfield Gazette, and the following April in the New Hampshire Sentinel. In 1864, "Washington's Vision" was published as a pamphlet, now available for online viewing courtesy of Indiana University. It's possible that the original publication was an even earlier 1861 pamphlet that the Inquirer quoted from. The 1864 edition of "Washington's Vision" comes with a cover blurb from Edward Everett, the important and sadly forgotten Massachusetts politician and orator. (I wonder if he ever actually saw the pamphlet.) The same publication contains poetry and a story about 99-year-old Jane Seymour knitting stockings for Washington's army, then much later for the Union army during the Civil War. It's patriotic propaganda through and through, as shown by the cover line "The First Union Story Ever Written." Are there any reliable facts in "Washington's Vision"? A man named Anthony Sherman did serve in the Continental Army. He applied for and received a pension in the 1830s. However, his pension application said he wasn't at Valley Forge in the winter of 1777-78; he was with Gen. Benedict Arnold's army instead. Furthermore, Anthony Sherman is not listed among Revolutionary veterans receiving a pension in 1840, meaning he had died by that year—well over a decade before he supposedly spoke to Wesley Bradshaw in Philadelphia. purported to be true stories of murderers and female fiends, full of torture, murder and melerdrama, usually beginning on page 19, so a 64 page work was not all it was advertised to be. (Note that Washington's Vision gets rolling on page 11.) Thus, if we believe the story Alexander tells in "Washington's Vision," he heard of an angelic prophecy crucial to the nation, and chose to publish it under the same pseudonym he used for exploitative potboilers. In fact, a big part of Alexander's work was responding to recent public events with patriotic thrillers and legends. During and after the Civil War he wrote and published several novels such as Pauline of the Potomac; Or, General McClellan's Spy; its sequel Maud of the Mississippi, General Grant's Daring Spy; and the immortal The Angel of the Battlefield: A Tale of the Rebellion. In 1876, just in time for the Centennial celebration, Alexander came out with The History and Legends of the Old Liberty Bell in Independence Hall in Philadelphia. "Washington's Vision" is part of that fictional output, not a historic link to Valley Forge. Nonetheless, "Washington's Vision" has been reprinted many times since 1861, including in the Grand Army of the Republic's newspaper, the National Tribune, in 1880, and its successor Stars and Stripes in 1950. And now it's on the internet, so it will never die. Tomorrow the History Channel is scheduled to air a program on Gen. Horatio Gates, commander of the Continental forces at Saratoga. The program will probably feature comments by A Student of History, John Maass. After that comes a program on Gen. Nathanael Greene, who also followed Gates as commander of the Continental Army in the southern theater. I found what I want for my birthday! This delightful Ralph Earl painting from about 1783 of two brothers is being offered by the Hirschl & Adler Gallery. I'm not sure Earl set out to show the boys half-hugging, half-roughhousing, but there's a real sense of a fraternal relationship here. By 1777, local newspapers were denouncing Earl as a traitor, and he had to sneak into British-occupied Newport for safety. From 1778 to 1785 he worked in London, studying with Benjamin West. Then he returned to the U.S. of A., probably expecting to be the big fish in the small pond. Unfortunately, business wasn't always up to his expectations, and he did some of his best work while imprisoned in New York for debt. Earl died at age fifty of, one critic said, "intemperance." See more about him in this biography from the Worcester Art Museum. Here's a self-portrait, also for sale. And a page of links to Earl's work in museums around the country. We met with nothing material on our passage; only a little girl of about nine years of age fell over board and was lost. The appearance of "Anticks," or mummers, in Revolutionary Boston, as described in yesterday's post, was not enjoyed by all. The time will soon arise on which the ANTICKS are wont to assemble. The disadvantages, interruptions and injuries which the inhabitants sustain from these gangs, are too many for enumeration, a few only must suffice. When different clubs of them meet in the street, noise and fighting immediately commences. Their demands for entrance in houses, are insolent and clamorous; and should the peaceful citizen (not choosing to have the tranquillity of his family interrupted) persevere in refusing them admittance, his windows are broke, or the latches and knockers wrenched from his door as the penalty; Or should they gain admittance, the delicate ear is oftentimes offended, children affrighted, or catch the phrases of their senseless ribaldry. And a Merry Christmas to you, too, sir. Here's a seasonal memory from Samuel Breck, born in Boston to a well-to-do merchant during the Revolutionary War; Recollections of Samuel Breck was published posthumously in Philadelphia in 1877. I forget on what holiday it was that the Anticks, another exploded remnant of colonial manners, used to perambulate the town. They have ceased to do it now, but I remember them as late as 1782. They were a set of the lowest blackguards, who, disguised in filthy clothes and ofttimes with masked faces, went from house to house in large companies, and, bon gré, mal gré, obtruding themselves everywhere, particularly into the rooms that were occupied by parties of ladies and gentlemen, would demand themselves with great insolence. I have seen them at my father’s, when his assembled friends were at cards, take possession of a table, seat themselves on rich furniture and proceed to handle the cards, to the great annoyance of the company. A doctor must be had." He calls for a doctor, who soon appears, and enacts the part so well that the wounded man revives. In this way they continue for half an hour; and it happened not unfrequently that the house would be filled by another gang when these had departed. There was no refusing admittance. Custom had licensed these vagabonds to enter even by force any place they chose. Folks who know about English folklore have no doubt recognized these "Anticks" as traditional Christmas mummers. Such misrule was one of the reasons the Puritan founders of Massachusetts were so down on Christmas (along with the little matter of the date not being mentioned in the Bible). By the time of Breck's childhood, however, such disapproval no longer prevented young men from enjoying this form of begging and theater. I haven't found any mentions of Anticks in Boston before the Revolutionary War, so I suspect the tradition took hold in those years, that it wasn't a relic of colonial times but actually a new import from Britain. That was probably partly due to the shake-up of society that the war brought about, and partly to the end of Pope Night as a holiday when young Bostonians could dress up, cavort, and demand coins from the upper class. State Representative Peter Koutoujian’s proposal to ban trans fats from Massachusetts restaurants has met with predictable howls of outrage from those insisting that the government has no right to tell them what to eat. I find this outpouring of libertarianism amusing because history shows that one of the primary functions of Boston's government was, in fact, the regulation of the food supply to ensure consumers received what they paid for and that the food they bought was healthy. Indeed, at the end of every month before the Revolution, Boston’s selectmen set the weight and price of loaves of bread sold in town, based on the price of flour. The annual big town meeting in March elected town officials called Purchasers of Grain and Surveyors of Wheat, among others. The Boston Public Library’s archive of town papers from this period includes an “Account of Bread taken from the Bakers, by the Clerks of the Market [yet another elected position], the year past,” dated 27 Feb 1768. And of course those loaves contained no more than a trace of trans fats. This morning I’m sharing a bit of travel literature: Patrick M’Robert’s A Tour Through Part of the North Provinces of America: Being, a Series of Letters Wrote on the Spot, in the Years 1774, & 1775, published in Edinburgh in 1776. You may also be surprised that I say nothing of the unhappy contest now subsisting between this and the mother country: This I leave to politicians; but am afraid both parties will repent when too late their having launched so inconsiderately into it. When it will end, God only knows, I fear the ruin of one, if not of both countries. They have been great adventurers in trade, and generally successful; they are very inquisitive, want to know every circumstance relating to any stranger that comes amongst them, so that a traveller lately in that country had been so pestered with their idle queries, that, as soon as he entered a tavern, he used to begin and tell them, he was such a one, telling his name, travelling to Boston, born in North Britain, aged about thirty, unmarried, prayed them not to trouble him with more questions but to get him something to eat: this generally had the desired effect. Today I drive the reverse route, and beyond, so new postings might be spotty for the next week or so. I do not subscribe to using the Koran in any way. The Muslim Representative from Minnesota was elected by the voters of that district and if American citizens don't wake up and adopt the Virgil Goode position on immigration there will likely be many more Muslims elected to office and demanding the use of the Koran. . . . The Ten Commandments and "In God We Trust" are on the wall in my office. A Muslim student came by the office and asked why I did not have anything on my wall about the Koran. My response was clear, "As long as I have the honor of representing the citizens of the 5th District of Virginia in the United States House of Representatives, The Koran is not going to be on the wall of my office." Goode's attempt to raise the immigration issue is impertinent; the Representative whom he criticized had ancestors living in America before the U.S. of A. was founded. The voters of each Congressional district select the representative that they choose to represent them, and perhaps voters in all districts will now ask prospective candidates whether they will use the Bible, the Koran, or anything else. Thus, the very same constitutional article that requires oaths or affirmations also states that there should never be a religious test for a public officeholder in the U.S. of A.—yet Goode is advocating just such a test. Goode clearly has chosen not to "support and defend the Constitution," nor "bear true faith and allegiance to the same." Instead, he has chosen to ignore and demean one of the Constitution's clear requirements. While criticizing how another elected Representative might take his oath, Virgil Goode broke his own. To compound the sad irony, Goode represents the part of Virginia that includes Charlottesville and Monticello, Thomas Jefferson's home. Jefferson was of course highly proud of drafting Virginia's statute for religious freedom. A posting at A Student of History, by John Maass, alerted me to a recent ceremony in Washington, D.C., respecting Oscar Marion, enslaved servant of Revolutionary War general Francis Marion (1732-1795). 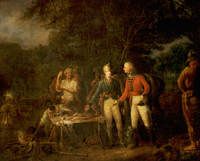 As the Washington Post reported, many nineteenth-century images of Gen. Marion include a black servant in the background. The best known of these is "General Marion Inviting a British Officer to Share His Meal," now hanging on the Senate's side of the U.S. Capitol. The black man is never identified in those paintings, but genealogist Tina Jones recovered the knowledge that Marion was served throughout the war by an enslaved man named Oscar. The Post quotes Jones as saying of Oscar Marion, "He is not just some obscure figure in the background. This person had a name. He had a life and a separate contribution." Which is true, but it's very hard to tell what his individual life and thoughts were since (a) he was trapped within the American slavery system, and (b) our sources seem to be all generated by his master's family. Presiding over the recent ceremony, George W. Bush praised Oscar Marion's "devoted and selfless consecration to the service of our country," but of course the man didn't have a free choice. He was "selfless" first because American law assigned his self to another man. John Blake White (1781-1859) created the painting at the Senate in the 1820s, after Francis Marion's death. The artist said he had met the general when he was a boy, and painted the man's face from memory. But White made no such claim of accuracy about the other men in the painting. There thus seems to be no evidence that White tried to paint the individual Oscar Marion, or met the enslaved man at the same time he met the general. Instead, I think the painting shows little more than a symbol of a helpful enslaved servant. The black man's features aren't distinctive, and even his pose reflects the notion of servitude: kneeling to prepare food for the white men who stand above him. The individual whom Gen. Marion called Oscar is still probably faceless. Similarly, a black servant stands in the background of a couple of paintings of George Washington: John Trumbull's 1780 portrait and Edward Savage's 1796 picture of the Washington family. In recent years people have rushed to identify those figures as William Lee, the enslaved bodyservant who accompanied the Washington throughout the Revolutionary War. Both Trumbull and Savage painted from life. Trumbull probably encountered Lee many times when he served as an aide at the general's headquarters in Cambridge, so he could have indeed painted the individual Lee. But the face in Trumbull's painting looks like a caricature. As for Savage, when he described his painting, he didn't even mention the black man in the background, just as he didn't mention the table at the center. I think we might be wishful to interpret these paintings as containing portraits of individual black men. Last week we saw an elaborate ceremony for a departing military administrator, so it seems appropriate to recall how Gen. George Washington bid farewell to his officer corps at the end of the Revolutionary War. The time now drew near when the Commander-in-Chief intended to leave this part of the country for his beloved retreat at Mount Vernon. On Tuesday, the 4th of December, it was made known to the officers then in New York, that Gen. Washington intended to commence his journey on that day. At 12 o’clock the officers repaired to Francis' Tavern, in Pearl Street, where Gen. Washington had appointed to meet them, and to take his final leave of them. Gen. [Henry] Knox being nearest to him, turned to the Commander in Chief, who, suffused with tears, was incapable of utterance, but grasped his hand; when they embraced each other in silence. In the same affectionate manner, every officer in the room marched up to, kissed, and parted with his General-in-Chief. Such a scene of sorrow and weeping I had never before witnessed, and hope I may never be called upon to witness again. It was indeed too affecting to be of long continuance—for tears of deep sensibility filled every eye—and the heart seemed so full, that it was ready to burst from its wonted abode. Not a word was uttered to break the solemn silence that prevailed, or to interrupt the tenderness of the interesting scene. The simple thought that we were then about to part from the man who had conducted us through a long and bloody war, and under whose conduct the glory and independence of our country had been achieved, and that we should see his face no more in this world, seemed to me utterly insupportable. But the time of separation had come, and waving his hand to his grieving children around him, he left the room, and passing through a corps of light infantry who were paraded to receive him, he walked silently on to Whitehall, where a barge was waiting. We all followed in mournful silence to the wharf, where a prodigious crowd had assembled to witness the departure of the man who, under God, had been the great agent of establishing the glory and independence of these United States. As soon as he was seated, the barge put off into the river, and when he was out in the stream, our great and beloved General waived his hat, and bid us a silent adieu. We paid him the same compliment, and then returned to the same hotel whence Gen. Washington had so recently departed. Of course, Washington came back to the national scene, first to chair the Constitutional Convention of 1787, then as President from 1789 to 1797, and finally as commander-in-chief during the “quasi-war” scare of 1798. But one of his greatest services to the U.S. of A. was to establish a tradition of bidding farewell to public posts when voluntary retirement from a position of unequaled power in a society was practically unknown. And a friendly welcome to everyone who's visiting for the first time because Boston 1775 became one of Blogger's "Blogs of Note" today! Today’s special Boston 1775 entry comes from Ray Raphael, author of The First American Revolution, A People’s History of the American Revolution, and Founding Myths. You can download Ray's lecture on “Samuel Adams, Paul Revere, and ‘the Body of the People’” at Old South Meeting-House in September here. First, Arnold was to gather reliable intelligence: “You are by every means in your power to endeavour to discover the real sentiments of the Canadians towards our cause & particularly to this expedition.” To accomplish his mission, Arnold and his soldiers would first have to win the hearts and minds of the people, French Canadians and Indians who had only recently been subjected to British rule. Without their “favourable disposition,” Washington predicted, the expedition would inevitably flounder and fail. Arnold should also return if the weather became too severe or if any other “unforeseen difficulties should arise.” In short, Washington gave Arnold free rein to “cut and run” should the circumstances turn sour. Historical parallels are never perfect, of course. Times do change. So in the unlikely event that George 43 does decide to follow the advice of George 1, he will have to adjust his actions to suit the unique circumstances of today. George 1 did not have to worry about WMDs hidden deep within Canadian bunkers, for instance, nor did he benefit from the extensive “military experience” George 43 received in the Alabama National Guard. In the spirit of today's posting about George W. Bush and George Washington, but on a lighter note, here's a link to Poor George's Almanac, a page-a-day calendar created by Frank O'Dette. It juxtaposes the epigrams Benjamin Franklin borrowed for his Poor Richard's Almanack and other Franklin quotations with comments on the current administration. IMDB.com indicates that Laura Linney has been cast as Abigail Adams opposite Paul Giamatti in the HBO adaptation of David McCullough’s biography of John Adams, now in preproduction. But what about the rest of the Boston Whig crowd, not to mention the Continental Congress? For example, for the part of John Hancock, may I suggest Tony Award-winner Jefferson Mays? Yesterday I posted the first list ever published of men reportedly involved in the Boston Tea Party on 16 Dec 1773. It didn’t appear in print until 1835, when it was an appendix in Traits of the Tea-Party, written by Benjamin Bussey Thatcher. Purkitt, Hooton, Sprague, and Dolbeare, mentioned in Thatcher’s book; Purkitt was probably also responsible for his master Peck being listed. The Hunnewell boys, Jonathan and Richard, Jr.
Joshua Wyeth, apprenticed to blacksmiths Gridley & Whiston. And perhaps others as well. The 1835 list probably has a higher percentage of apprentices than the original group because the youngest members of the crowd were most likely to have survived into the period when men began to talk of their experiences. Those teenagers probably tagged along with fathers or masters, or joined in spontaneously, as Purkitt described to Thatcher. The name "McIntosh" on that list is often linked to Ebenezer Mackintosh, a street leader during the anti-Stamp protests of the mid-1760s. However, he seems to have been far less active by this time, perhaps not even in town. His one recorded comment on the Tea Party implies that he knew the men who had carried it out, not that he did it himself. I wonder if "McIntosh" could have been Peter Mackintosh, an apprentice in the same firm as Wyeth. Of the 50 or so grown men left on that list, ten (20%) had volunteered to patrol the docks in November, according to meeting notes by town clerk William Cooper. (That number was eleven if Cooper's "Benjamin Stevens" was a mistake for Ebenezer Stevens.) Most likely the same set of politically committed men were eager for both types of duty. It's also conceivable that men who patrolled the docks (or their descendants) came to think of that activity as part of the actual tea destruction. The 1835 list has at least one error. It names Dr. Thomas Young, but a report to the British government from an informant in Old South Meeting-House makes clear that he was addressing the crowd about the medicinal risks of drinking tea while men boarded the ships. Some historians have suggested that Dr. Young made this speech in order to keep the meeting-house crowd out of the streets so those men at the docks could get to work quickly. Most of the rest of Boston's top Whigs were also at Old South, giving themselves air-tight alibis for the night. The major exception was the merchant William Molineux, so the 1835 list is probably correct that he was at Griffin's Wharf. Who was responsible for the list itself? Thatcher described it as “furnished to us by an aged Bostonian.” That person did not claim to have been involved in the Tea Party itself, but must have gathered information about it from many sources, given how the men he listed had scattered during and after the Revolution. No one seems to have talked for attribution in print about the Tea Party until 1826, when the U.S. of A. was all excited about the fiftieth anniversary of independence. That was also the time that the phrase “Boston Tea Party” seems to have become popular. Early in that year Joshua Wyeth, then living in Cincinnati, began to speak publicly of his experience. In July, Nicholas Campbell of Warren, Rhode Island, let himself be named in the newspapers. The next year, a minister/journalist named Timothy Flint published a longer article about Wyeth, which seems to have been the first widely publicized first-person account of the tea destruction. Wyeth is not the only one [of the Tea Party] who survives. There are two or three in Boston, and two, it is said, not of this city, who yet live. The Gazette then went into more detail about some recently deceased men involved who had helped to destroy the tea without naming any names. It seems significant to me that the first men who broke the tradition of anonymity were living outside Boston. Men back in Boston might not have felt the need for public acclaim if some of their neighbors already knew privately what they had done. Living in Boston would also have made it harder to exaggerate one's role. He was also one of the number (and, so far as we know, has left but three survivors) who on the 16th Dec. 1773, proceeded to the tea ships, (which were at the wharf now called Liverpool wharf, then Griffin’s) and destroyed their cargoes. Thus, journalists at the Gazette and the Centinel were keeping track of the Tea Party veterans—and the Centinel was no longer adhering to anonymity even after death. The 1834 publication of A Retrospect of the Tea-Party by James Hawkes, based on conversations with George R. T. Hewes (who had moved to upstate New York), turned the Tea Party into a public event in Boston at last. Hewes was brought to the city and honored. He has his portrait painted; as shown above, it is now displayed at the Old State House Museum. Thatcher sat down with Hewes to write a second book—the book that contained the first attempt at a complete list of tea destroyers. The man who presided over the Hewes celebration was Benjamin Russell (1761-1845), publisher of the Columbian Centinel. He was also a politician and president of the Massachusetts Charitable Mechanics Association, which in January 1836 invited Thatcher to speak on the Tea Party to them. That organization's first two presidents, Paul Revere and Jonathan Hunewell, appear on the 1835 list, as does its first treasurer, Samuel Gore, and some other members. Francis S. Drake's Tea Leaves (1884) cites Russell as describing how his father John Russell and Thomas Moore disguised themselves for the evening, and as speaking to John Prince about what he saw of the tea destruction. All three of those men appear on the list. So I think the signs point to septuagenarian Benjamin Russell as the "aged Bostonian." He had a lasting interest in the Tea Party, and political reasons for maintaining its importance. He had connections to many of its veterans who had remained in Boston, and through his newspaper a means of gathering information on others. And he had links to Thatcher and his book. In Historic Boston and Its Neighborhood, Edward Everett Hale (1822-1909) wrote that almost everyone in Boston was complicit in the effort to destroy the East India Company tea, but only a select group actually carried out the deed. So far as anyone knows, they never did mention it. Of which this curious consequence has come into history, that if, within the last seventy-five years, any old gentleman has said that he was of the Boston Tea-Party, it is perfectly sure that he was not one of the party of men who really did throw the tea into the harbor. If, on the other hand, any nice old gentleman, asked by his grandchildren if he were of the Tea Party, smiled and put off the subject and began talking about General Washington or General Gage, it is well-nigh certain that he was one of that confederation. That's a delightful picture, idealized but nonetheless getting at the challenge of identifying exactly who destroyed the tea. The Revolutionary generation tended not to boast of their collective activities, at least not for many years. However, the Tea Party was so lionized in the 1830s that past that date many men and families claimed to have a connection to the event. Some of those claims were outright frauds. Some are impossible to confirm or deny. And a few almost certainly were true, given the men's records as Whig activists and how early the first claims on their behalf appeared. TOMORROW: On the actual anniversary of the Boston Tea Party, the Boston 1775 analysis of this list. How accurate is it? What are its biases? And which “aged Bostonian” might have compiled it? When B. B. Thatcher wrote Traits of the Tea Party in 1835, he interviewed a few surviving participants in the Boston Tea Party along with his principal informant, nonagenarian George R. T. Hewes. Naturally, those survivors tended to be the youngest participants. Given that attitude and the need for secrecy and control, I think it’s very unlikely that the men who planned the destruction of the tea would have recruited teenagers in advance. Recall how Benjamin Edes didn’t let his sixteen-year-old son Peter even know what was going on. But of course the men couldn’t stop teenagers from tagging along, or pushing their way in. Purkitt, with [Edward] Dolbier, was an apprentice with [Samuel] Peck, the cooper, in Essex Street...and he speaks of their hearing, at their work in the evening, (having left the door of their shop open,) the loud whistle (the famous whistle of our friend Hewes, doubtless) which roused them, and which they followed till it brought them to the wharf. Their part of the play there was chiefly to jump over into the flats by the side of one of the vessels—for it was nearly low tide (Hooton says just beginning to flow)—and, with other boys, by direction of the commander, beat up more thoroughly the fragments of boxes and masses of tea, which were thrown over in too great haste. They found their return upon deck a good deal facilitated by the immense pile which accumulated beneath and around them. . . .
Purkitt and Dolbier went home early. Peck, who was believed to be one of the Chiefs, came in, rather softly, at one in the morning. The boys noticed some relics of red paint behind his ears the next day. The only tools they used were both made of a stave, before they started. An analysis of tides by Donald W. Olson and Russell L. Doescher in the December 1993 Sky and Telescope magazine shows that there was an unusually low tide in Boston harbor on the night of 16 Dec 1773. (There’s an abstract of that research here, though it misnames the tea ship Eleanor as the Endeavour.) Astronomy thus confirms the apprentices’ memories that the tea leaves thrown overboard quickly started to pile up and poke out of the water. Since the protesters thought it was vital to destroy all the tea, they made sure it all got beaten down into the salt water—and that’s when these teenaged apprentices proved that they could be useful. Whatever we call the Boston Tea Party—civil disobedience, political protest, destruction of private property, vigilante politics, terroristic intimidation—it was not a riot. Boston had several of those in the years from 1765 to 1777 (and others before and afterward). In riots, crowds spontaneously rampaged against individual people and buildings; the genteel political leadership sometimes tried to stop the violence and always disavowed it. This is the most magnificent Movement of all. There is a Dignity, a Majesty, a Sublimity, in this last Effort of the Patriots, that I greatly admire. To get to the tea chests on one ship, the men had to break a lock. So scrupulous were the organizers that the next day someone anonymously supplied the ship’s captain with a replacement lock. The only property they wanted to destroy, they thus signaled, was the dutied tea. Captain Conner, a letter of horses in this place, not many years since remov’d from dear Ireland, who ript up the lining of his coat and waistcoat under the arms, and watching his opportunity had nearly fill’d ’em with tea, but being detected, was handled pretty roughly. They not only stripp’d him of his cloaths, but gave him a coat of mud, with a severe bruising into the bargain; and nothing but their utter aversion to make any disturbance prevented his being tar’d and feather’d. Despite the organizers’ best efforts, however, at least one man at the Tea Party brought a little tea home with him. The Bostonian Society exhibits a small vial of leaves that Thomas Melvill (grandfather of novelist Herman Melville) reportedly shook out of his boots and the wrinkles in his clothing when he went home that night. The Massachusetts Historical Society owns a similar jar of leaves, shown above when it was on display at the Herbert Hoover Presidential Library, but those were collected from the seawater at Dorchester. Hewes recalled men rowing around the harbor on 17 Dec, pounding floating masses of tea into the water to ensure that none remained drinkable. On 16 Feb 1836, an elderly printer in Bangor, Maine, named Peter Edes wrote to his grandson, Benjamin C. Edes, about events in Boston over sixty years before. Two recent books based on the memories of George R. T. Hewes had produced a great deal of excitement in America over the "Tea Party," as writers had just started to call the destruction of the East India Company tea on 16 Dec 1773. You request of me a particular account of the "tea-party," so called. I know but little about it, as I was not admitted into their presence, for fear, I suppose, of their being known; but what little I know I give you, so far as I can remember. I recollect perfectly well that on the afternoon preceding the evening of the destruction of the tea, a number of gentlemen met in the parlor of my father's house—how many I cannot say. As I said before, I was not admitted into their presence, my station was in another room to make punch for them in the bowl which is now in your possession, and which I filled several times. They remained in the house till dark, I suppose to disguise themselves like Indians, when they left the house and proceeded to the wharves where the vessels lay. Before they reached there, they were joined by hundreds. After they left the room, I went into it; but my father was not there. I therefore thought I would take a walk to the wharves, as a spectator, where was collected, I must say, as many as 2,000 persons. The Indians worked smartly. Some were in the hold immediately after the hatches were broken open, fixing the ropes to the tea-chests; others were hauling up the chests; and others stood ready with their hatchets to cut off the bindings of the chest and cast them overboard. I remained on the wharf till I was tired, leaving the Indians working like good industrious fellows. This is all I know about it. The bowl I left in your mother's possession I present to you most cheerfully, hoping it will never go out of the family. . . . It is a little surprising that the names of the tea-party were never made public: my father, I believe, was the only person who had a list of them, and he always kept it locked up in his desk while living. After his death [in 1803] Benj. Austin called upon my mother, and told her there was in his possession when living some very important papers belonging to the Whig party, which he wished not to be publicly known, and asked her to let him have the keys of the desk to examine it, which she delivered to him; he then examined it, and took out several papers, among which it was supposed he took away the list of the names of the tea-party, and they have not been known since. Some historians doubt such a list actually existed. In any event, it has never surfaced. One of the Bostonians caught up in the conflict over taxed tea was the brilliant portrait painter John Singleton Copley (1738-1815). He had no part in the tea business, but his father-in-law and brothers-in-law did. In 1769 Copley had married Susannah Clarke; her father Richard headed one of the three firms designated as tea consignees in the London. I am desireous of avoideing every imputation of party spir[it], Political contests being neighther pleasing to an artist or advantageous to the Art itself. The various and discordant Noises with which my Ears are continually assaild in the day, passing of Carts and a constant throng of People, the shouting of an undisiplined Rabble the ringing of bells and sounding of Horns in the night when it might be expected that an universal silence should reign, and all nature weary with the toils of the day, should be composed to rest, but insted of that nothing but a confused medley of the rattlings of Carriages, the noises of Popes Drums and the infernal yell of those who are fighting for the possession of the Devill. . . . I have been several days attentively observing the movements of our Son’s of Liberty, which was wonce (like the word Tyrant) an honorable distinction. A short Sketch of their proceedings may not be disagreeable as nothing in the Papers is to be depended. Last tuesday Morng. a considerable Number of Printed papers was pasted up, directed to the freemen of the Province inviting them to meet at Liberty Tree at 12 o’Clock the next day to receive the resignation upon Oath of those Gentle’n to whom the India Company have consigned their Tea of their Commission and their promise of reshipping it by the first opportunity. In 1765, a Boston crowd organized by the Loyall Nine had summoned the government's Stamp agent to resign in the same spot. But the Clarkes refused to follow that example, all the while hinting that they might find some compromise to satisfy the local demands. On the 3rd and again on the 13th, mobs stormed the Clarkes' office; Jonathan, the son who had helped secure the East India Company contract, fired his pistol out a window, but no one was hurt. The town's leaders tried to head off violence by channeling public anger through legal protests: committees and petitions. Meanwhile, the Clarkes asked for help and protection from the provincial government. On 28 November, the first tea ship arrived, heightening the crisis. The next day, Boston saw its first mass meeting against the tea, and the Clarkes moved to Castle William, the fort in Boston harbor held by the British military. Copley then became the mediator between his in-laws and the assembled populace. On 30 November, he asked the meeting on behalf of the Clarkes “Whether they [could] come with safety, and remain so till they have returned and not be hissed; and the question being put, passed in the affirmative.” The crowd voted to give Copley two hours to travel to the Castle and talk to his relatives. That afternoon, Copley returned to say the Clarkes “thought they might be safe, yet, seeing the terms were such as to the tea as was out of their power, they thought it best not to come.” He argued that they would be ruined financially if they returned the tea to London, as the meeting demanded. But the crowd did not relent, and Copley's role in the negotiations ended. From that point on, Copley was associated with the supporters of the royal government. In April 1774, he was hosting Col. George Watson, a Plymouth merchant whose portrait he had painted in 1768. A crowd gathered outside his Beacon Hill home, pressuring Watson to resign from the new Council appointed in London instead of elected in Massachusetts. The next month, Copley declared himself a friend of the royal government by signing an Address that praised departing governor Thomas Hutchinson. Soon afterward, in June 1774, Copley headed to England for the first time. After a tour of Europe to see some of the artworks he had long read about, he returned to Britain. He may have hoped the political conflict had calmed, but now the Crown and his native province were at war. Copley settled in London, becoming a history painter. One of his sons became a well-known lawyer and eventually received the title Baron Lyndhurst. Who had an economic interest in opposing Parliament's Tea Act of 1773? the people here will have an opportunity of buying good English Tea, for half the price we expected to extort from them for the trash lodged in your hands from Holland. Benjamin Labaree's The Boston Tea Party (1966), in which that quote appears, argues that the price of tea in Holland was low enough that its sellers still had room to cut their prices and undersell the importers of British tea. Nevertheless, those businessmen would have faced lower profits. The very establishment of exclusive trading companies is an infringement of that distinguished petition of the free Briton which from time immemorial he had forced his sovereign to recognize [—] his right to a FREE TRADE. However, I don't think the opposition of Dutch tea smugglers can account for the Boston Tea Party. To begin with, as observers on both sides stated at the time, the trade in Dutch tea was much smaller in Boston than it was in New York and Philadelphia. 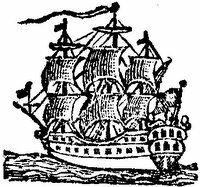 Customs records show much more legal British tea coming into Boston in 1771-73 than into either of the southern cities, though they had larger populations. Fewer Dutch tea smugglers in Boston logically meant far less political influence. Furthermore, when evidence lets us infer who in Boston was selling Dutch tea, it rarely points to the most politically active merchants. Some were simply wealthy opportunists like Solomon Davis and John Rowe. Others were friends of the royal government, such as Henry Lloyd, who had family ties to New York. There was little overlap between this group and Boston's Whig leaders. The popular protests against the dutied tea from Britain also gave rise to calls for a general boycott on all tea, which could hardly have benefited men who had invested in Dutch tea. As I wrote last week, I think the opposition to the East India Company tea, cheaper though it was, derived from the popular perception that the Tea Act was just the latest in a series of oppressive measures constraining the local economy. And I think it's more enlightening to consider who had an economic interest in enforcing the Tea Act. A quick reminder that this year's reenactment of the tumultuous meeting preceding the Boston Tea Party will take place on Sunday, 10 December, at Old South Meeting-House. A letter from Governor to S. Greenleaf, Esq., read. The sheriff is charged with a message from Governor. Voted, [the message] to be read. The message from Governor read and hissed. As I described yesterday, those meetings also established volunteer patrols on the wharf where the tea ship Dartmouth was docked to prevent its taxable cargo from being unloaded. These patrols had the form, if not the legality, of militia units. Admiral John Montagu (whose portrait is shown here) described men on the wharf patrolling "like Sentinels in a garrison." 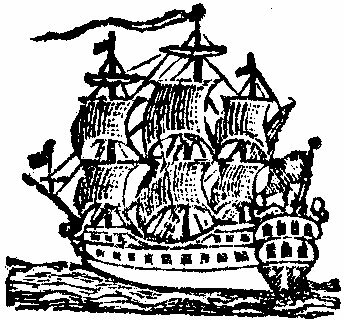 On 2 December, the Eleanor arrived at the wharfs with its own cargo of tea, and on the 7th the Beaver appeared in the harbor (though it had to stay away from the docks for a week because of smallpox). Faced with a defiantly militant town, Hutchinson responded by using his own military authority. As governor, he nominally commanded the militia—but what good was that if very few men would obey him? Instead, he called on the regular military. On 8 December, the governor told the admiral to prevent the Dartmouth from leaving Boston without a Customs clearance. Montagu ordered warships to block the channels out of the harbor. A pseudonymous writer in the Boston Gazette also claimed that the British army regiment in Castle William had loaded the cannons in that island fort. The governor's threat came through loud and clear to the ships' captains. On the 14th, Capt. James Bruce of the Eleanor told the crowd at Old South that he had no personal objections to sailing away without unloading the tea, but that he “was liable to be shot at by 32-pounders” if he tried. On the 16th, as the deadline for the Dartmouth's unloading or confiscation loomed, Hutchinson and Montagu offered to have the ship towed out to the naval fleet, where the warships could protect it. Francis Rotch, the twenty-three-year-old son of the ship's owner who was trying to negotiate an end to the stand-off, thought that few sailors would agree to help with this maneuver, and the mob would surely punish him and any man who did. He declined. Therefore, that night the tea ships still floated near Griffin's Wharf, guarded only by local patrols. CORRECTED: Originally this posting was illustrated by a monument in Westminster Abbey that, Manfred Mondt kindly informed me, honored not Admiral John Montagu but his son Capt. John Montagu. The picture above comes to us from Newfoundland, where Admiral Montagu was governor in 1776-78. Friends! Brethren! Countrymen! The Hour of Destruction or Manly Opposition to the Machinations of Tyranny stares you in the Face. Men (there’s no evidence for women participating) gathered first at Faneuil Hall, built to house Boston’s town meetings, and then adjourned to the Old South Meeting-House, which had more space and was therefore used for the town's largest events. Town clerk William Cooper kept notes on the proceedings, which were conducted with a moderator and votes like a town meeting. He apparently used these notes to create reports to the town's newspapers. In sum, Bostonians registered their opposition to the landing of the tea in as open and orderly way as they could. However, these gatherings were not official town meetings. They were an ongoing “assembly of the inhabitants of this and the neighboring towns.” There were two reasons for this distinction, I think. First, the mandate of a town meeting didn't extend to preventing a legal, healthy product from being unloaded by its owners. Second, the Whigs thus communicated that neighboring towns shared their opposition to the tea. During a second series of meetings in mid-December, attendees even sought gentlemen from outside Boston to preside. A motion was made that there be a watch kept for the security of Captain [James] Hall’s vessel and cargo; and the question being put, passed in the affirmative. Watch to consist of 25 men. Captain [Edward] Procter, Captain of Watch, Paul Reviere, Henry Bass, Moses Grant, Foster Condy, Joseph Lovering, Mr. John Lovel, Dr. [Elisha] Story, John Winthrop, Thomas Chase, John Greenleaf, Benjamin Edes, Benjamin Alley, Joseph Peirce, Junior, Joshua Pico, Captain Riordon, J. Henderson, John Crowe, Josiah Wheeler, Shubael H. [probably Hewes], John McFadden Henry, Joseph Edwards. The size of this "watch" and the title "Captain" for its commander hints that it was modeled on a military company, not on a group of night watchmen. (Boston's watchmen patrolled in groups of four, and their leaders were called "Constables of the Watch.") The meeting was basically commissioning a special militia company to patrol the wharf where the Dartmouth was moored. The phrase "for the security of Captain Hall’s vessel and cargo" meant not only that no one would harm those things, but also that no one would unload the cargo from the vessel, triggering the tea tax. And who were the first in line for this duty? As we might expect, a lot of them were politically active. Procter, Revere, Bass, Grant, Condy, Story, Winthrop, Chase, Greenleaf, and Edes are listed as attending meetings of the North End Caucus in 1771 (the only surviving notes from such a gathering). Bass, Chase, and Edes were members of the "Loyall Nine" who organized the Stamp Act protests of 1765. Grant and Condy had been kicked out of the Company of Cadets together in May for behaving disrespectfully toward the Customs Commissioners. There are a couple of unexpected names on this list. “Mr. John Lovel” was a Loyalist who probably suffered from manic-depressive mood swings; Brenton Simons’s Witches, Rakes, and Rogues discusses his tempestuous marriage. (If Cooper actually wrote, “John Lowell,” however, that would be another North End Caucus attendee.) [ADDENDUM, Dec 2008: The handwritten document is now online, courtesy of the Massachusetts Historical Society. 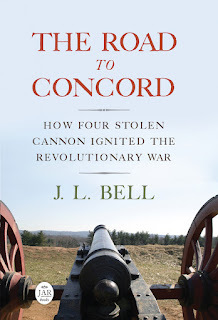 That name could easily have been meant as “John Lowel.”] Shubael Hewes, a brother of George R. T. Hewes, was also a Loyalist when the war broke out, but perhaps not at this date. Mr. Ezekiel Cheever as Captain, Mr. Thomas Uran, Joseph Eyres, William Dickman, William Sutton, Samuel Peck, Ebenezer Ayres, Thomas Bolley, W. Elberson, John Rice, Benjamin Stevens, Joseph Fourde, James Brewer, Obedh. Curtis, Rufus Bent, George Ray, William Clap, Benjamin Ingerson [Ingersoll? ], Nicholas Peirce, Adam Colson, Thomas Tileston, Daniel Hewes, Richard Hunnewell, Adam Colson, Nicholas Peirce. Voted, That the gentlemen who watch this night be desired to make out a list of the watch for next night, and so each watch another till for the time of watching is over. Voted, That in case the watch are molested the town be alarmed by the tolling of the bells, if in the night, if in the day by ringing of bells. Voted, That six persons be appointed who are used to horses, to be in readiness to give an alarm in the country when necessary: W. Rogers, Jere. Belknap, Stephen Hall, Nathanl. Cobbit, Thomas Gooding, of Charlestown, Benjamin Wood, of Charlestown. Voted, That the Committee of Correspondence for this town be desired to take care that every other vessel with tea that arrives, have a proper watch appointed for such vessels. Also, Voted, That those persons who are desirous of making a part of these nightly watches be desired to give in their names at Edes & Gill’s Printing Office. That printing office was where the Whigs usually met. For the next three weeks, therefore, citizen companies patrolled Griffin's Wharf every night. According to a tradition recorded in the Ebenezer Stevens family, on the evening of 16 December the watch had been recruited from the town's artillery company, made up mostly of eager young mechanics. Rather than preserve Capt. Hall's cargo, they gladly joined in what would become known as the Boston Tea Party. Cooper's notes appear in the 20th volume of the Massachusetts Historical Society Proceedings. Why tea, instead of any other commodity? Why throw it into the harbor? If the local Whigs disliked the tea tax so much, why didn't they just not buy tea? Why did a new tea-selling system which promised lower prices produce almost immediate opposition? How did one of the world's biggest and richest empires start to split apart over 342 crates of caffeinated leaves? The crisis was an artificial one, produced by Boston men at the docks refusing to let three tea ships be unloaded and the strict enforcement of two British Customs regulations. According to one law, ships had to land their cargo within a certain number of days after they arrived. Another law said the ships couldn't just sail away without unloading. The ship owners applied to Gov. Thomas Hutchinson for special exemptions, but he refused. Hutchinson felt that he had the radicals backed into a corner. The tea and ship owners would either brave the crowds and insist on unloading their property, or the Customs service would confiscate the cargo. Either way, the tea would go onto the local market and London would collect the tea tax. By destroying the tea, Boston's radicals cut that Gordian knot—but made Parliament very, very angry. The deeper question is why the Whigs were so opposed to anyone paying that tea tax. And it wasn't just Boston's radical organizers—most of the town supported them. The largest mass meetings of the pre-Revolutionary period occurred in November and December 1773 as "the Body of the People" gathered at Old South Meeting-House to discuss the tea. And it wasn't just Bostonians. Up and down the North American coast, colonists insisted that the tea not be allowed into their harbors or officially landed. Boston became the crisis point only because of how Gov. Hutchinson handled the dispute. A tea tax seems like a very small thing. It was a Customs duty on a single commodity. That substance wasn't truly necessary for life [though some mornings I think otherwise], so no one had to buy it. The tea supply chain clearly depended on the reach of the British Empire: it was grown in China, collected in India, processed in Britain, then shipped to America. What better commodity to tax to support that empire? And the Tea Act of 1773 promised to lower the consumer price of tea. So why did so many Americans complain about it? I think the answer lies in the Stamp Act of 1765. That was a broad-based tax on all printed documents: ship's papers, legal filings, licenses, newspapers, even playing cards. People did have to buy those things. That tax would have affected everyone in colonial North America. So it got everyone's attention, from Halifax to Savannah. They amplified the "no taxation without representation" principle that James Otis, Jr., had advanced in his losing argument against earlier, narrower Customs duties. They organized boycotts of British imports, thus enlisting the whole adult population to put economic pressure on London. In fact, T. H. Breen's The Marketplace of Revolution argues that this nonimportation movement was what first made the Americans colonists feel a common cause separate from Britain. The Stamp Act protests worked; Parliament repealed that law in 1766 before it could be put into practice. Then in 1767, London instituted the Townshend duties. Once again, the colonies responded with nonimportation, and those taxes were repealed in 1770—except for the one on tea. Thus, by 1773, a wide swath of Americans were steeped in the beliefs that any tax levied by Parliament without local approval was despotic, and that the Tea Act was just the latest step in an attempt to oppress them. Furthermore, in Massachusetts the Whigs suspected (rightly) that the tea tax was being used to pay salaries to various royal appointees, thus insulating them from local pressures. That dispute had been simmering for over a year before the tea crisis. It made what seems like a little issue—a few dried leaves—boil up into a constitutional crisis. I suspect that if Parliament had instituted a tea tax in 1765 instead of the Stamp Act, the opposition to it would have been less intense, and the Whig movement wouldn't have grown so strong by 1773. Maybe America wouldn't have gotten to the point of demanding independence in that century. Who knows? Tea might have remained our national drink. The 16th of December is the 223d anniversary of the Boston Tea Party. This year's reenactment of that fabled event won't occur on that Saturday, but on this upcoming Sunday, 10 December. It starts at 5:30 P.M. at Old South Meeting-House on Washington Street in downtown Boston, and is expected to last till about 7:00. Come and participate in this spirited re-enactment of the Boston Tea Party as "protesters" rally against the tea tax at the Old South Meeting House, which hosted the original gathering in December 1773. $5; Free for those dressed in colonial attire! In past years, the reenactment of the tea meeting has been followed by a march to the Boston Tea Party Ship, but that's undergoing renovation until 2008. Since Boston 1775 doesn't offer much information about the Tea Party yet, the coming days will focus on that event. Now I must go find postable material! Lane Smith's new John, Paul, George & Ben shows how "founders' chic" has come to picture-book publishing. In a lively mix of text and art, it tells young readers that John Hancock, Paul Revere, George Washington, and Ben Franklin (and Thomas Jefferson, thrown in as the George Martin of this Fab Four) were once lively kids just like you guys. Or at least just like the Peanuts gang. John, Paul, George & Ben is funny. The art is energetic and stylish (and Smith used Minuteman Printshop, a favorite at Boston 1775). The only thing that bothers me about the book is seeing it labeled as Nonfiction. Smith acknowledges that a great many of his wild colonial boys' antics are untrue. How can young readers tell the facts from what's in there for the sake of a joke? Well, there's a "True/False" page at the back to explain. If only that page were more accurate. The first incident in the book shows John Hancock signing his name too large on a classroom blackboard. The back of the book acknowledges that blackboards didn't show up in classrooms until many decades later. In fact, the whole classroom is an anachronism. Smith's artwork shows a large map of North America (a man who attended the same school as Hancock later wrote, "I never saw a map, except in Caesar’s Commentaries, and did not know what that meant”). The teacher is female. The class is even integrated. And all those misleading details are in service of another myth: that Hancock signed his name on the Declaration of Independence large enough for King George to read it. ("Reportedly," the back page says, which in this case may mean "actually not, but I've already written the book.") The American infatuation with the Declaration as a handwritten document dates from fifty years after its signing, when the first copies were made. 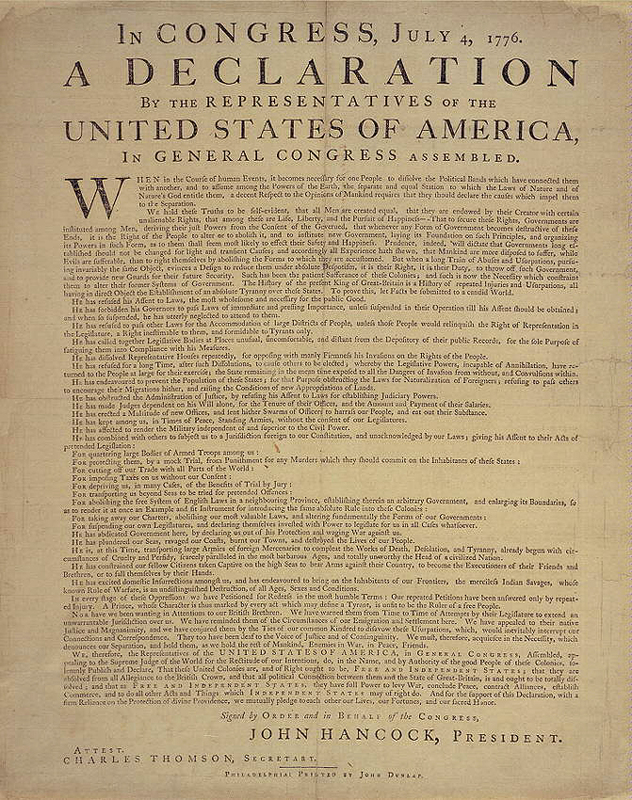 The Declaration was originally circulated in printed form, so the size of Hancock's signature didn't matter. The George Washington anecdote is built around the cherry tree legend, a defining part of American heritage because (a) everyone knows it, and (b) everyone knows it isn't true. Smith's punchline for this episode is less original than the rest of the book, but his visual exuberance carries it off. The book's portrait of Benjamin Franklin rests on his supposed penchant for sharing sayings and advice, using the mottos from Poor Richard's Almanack. American culture doesn't like to acknowledge that our model innovator Franklin actually cribbed most of those sayings—in order—from James Howell’s Lexicon Tetraglotton (1660) and Thomas Fuller’s Gnomologia (1732). He used them to fill space. Smith, like many other authors, gives Franklin credit for sayings he didn't create and didn't really care about. There was a salt-marsh that bounded part of the mill-pond, on the edge of which, at high water, we used to stand to fish for minnows. By much trampling, we had made it a mere quagmire. My proposal was to build a wharff there fit for us to stand upon, and I showed my comrades a large heap of stones, which were intended for a new house near the marsh, and which would very well suit our purpose. Accordingly, in the evening, when the workmen were gone, I assembled a number of my play-fellows, and working with them diligently like so many emmets, sometimes two or three to a stone, we brought them all away and built our little wharff. The next morning the workmen were surprised at missing the stones, which were found in our wharff. Inquiry was made after the removers; we were discovered and complained of; several of us were corrected by our fathers; and though I pleaded the usefulness of the work, mine convinced me that nothing was useful which was not honest. Leave off the moralizing last clause, and this is a great little story of an enterprising boy who was a natural organizer and didn't let anything stand in his way. Maybe this tale could show up in the Love remix.